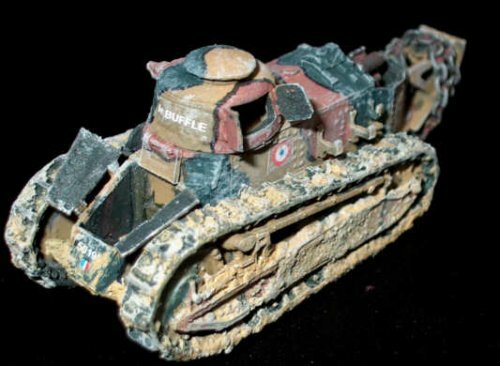 The French extensively used this WW 1 tank at the beginning of the war in 1940. They still had large quantities at hand and generally used them in second line for lower duties, for example as a tractor. The product design very much reminds me of ALBY. The yellow resin parts are delicately produced and lie in a clear blister box. The detail on all parts is very good but not exactly on par with ALBY as there has to be a lot of flash and casting errors removed. Adding to that I wished the bolts would be more recessed on the hull and turret ... but you cannot have everyting I guess ;-) The smaller parts, what I suspect are a couple of searchlights, suffer from warping and could not be used. Overall the fit is satisfying and assembly won't give you a hard time. The kit features two different turret versions. One is the rounded version, which I have used on my specimen, the other is a hexagonal turret with a hatch on top. The Ft-17 has one flat trailer which is probably used to flatten and even the soil, so this tank has been used by French engineers building fortifications (?). Assembling the major parts of this kit is done very easily, the tracks and wheels are already molded and have to be gently fit into each other. As I said earlier, the smaller parts are the weakest point of this kit and for instance the construction of the hatches and turret was quite fiddly. I couldn't manage to get the three-pieced engine cover right, so I left it off as well as some stowage to make a tank which has broken down and was just left by its crew ;-), as you see I plan all my tanks to be a diorama element later on. The front hatches for the driver can be opened, unfortunately the large pulling bars for driving are absent so you have to scratchbuild some. 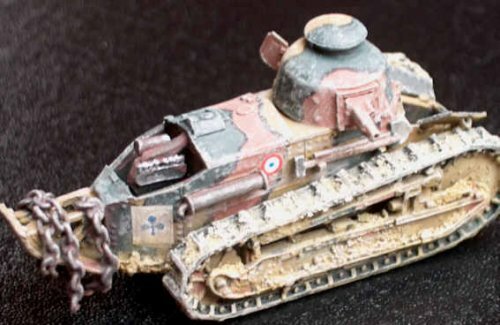 As I lack any interior reference about this nice little French tank I haven't bothered starting with that, until I can be sure what is supposed to be there. The same can be said about the engine compartment which I have not managed to get closed due to my own incompetence. The engine itself is one piece and neatly molded. I added a very small chain to the passing tail which was often seen there. This feature seen on many photographs probably underlines the usage and importance of the FT-17 as tractor, pulling heavy equipment and awkward goods like chopped lumber. 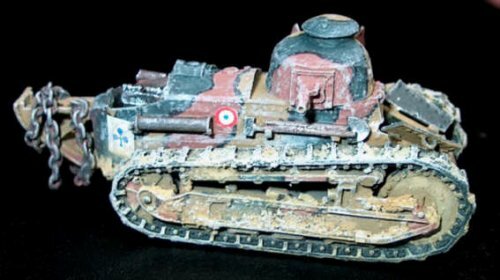 I know very little about French tanks, all I have is Jean Restayn's "Armour of the 2nd World War" book telling me the simple way of how the French marked their tanks with playing card motives. 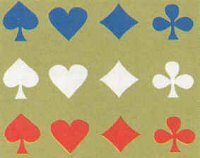 I always found them more appealing than anything I had seen before (even more then the funny German tactical marks). 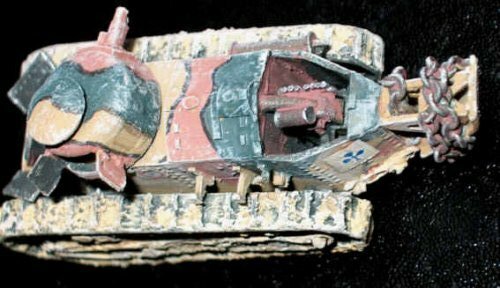 French tanks always attracted my attention as they were painted more colourful, (even in tanks the French culture is much superior to ours ;-) and they all have this common exotic/bizarre design that looks like a mixture of the First and Second World War. I modelled this FT-17 after another one I had seen in the Track-Link Gallery. Even the camo is pretty much the same although the tank on TL is a different version. I had got this tank together with a sheet from Aleran because I knew that my existing spare decals would not be sufficient enough to mark this tank. Regarding my reference a blue cross means that this tank belonged to the 1st company 4th platoon of a modernised French tank bataillon; (Refer to the table below). Adding to that the French had flags similar to the Russians but I won't enter into this field of research. I can very much recommend ALERAN decals, they are quite expensive but well researched and fit perfectly on any tank of this era although they are 1/76 which is hardly noticable, take look onto the Kitlist table of ALERAN. If you want to have it all 100% accurate then you are restricted to use them only for the appropriate tank noted in the instructions. I had the sheet FR-3 which is supposed to be used on Renault R35 & R40. 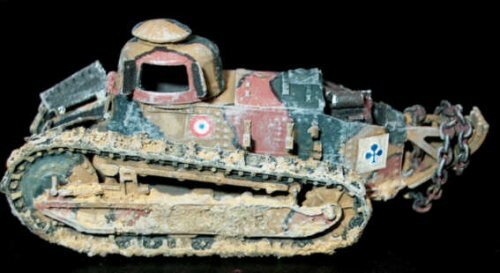 It has registrations plates, cocardes, white circles, slogans, white numbers and plenty of those playing card motives so its the best point to start with, when going into French AFV. I used the name "Buffle" for this tank which means Buffalo in English. Fits pretty well on a tractor, doesn't it? The camo is handpainted, I had tried this a lot lately and it looks okay. It think an airbrush could not just draw such a thin line as the black ones but you are always welcome to prove me wrong. Okay, with the large track links and the wide outer track teeth I had the idea to add some mud onto the tank. I mixed some gypsum particles with putty and applied it on the tracks and wheels. Well... uh oh, now it looks like a boar that just waded through the swamps. I had a hard time finding the right colour for the mud that it differs from the camo evidently.